The Generalitat Grand Prix of the Valencia Region will once again close the World Motorcycling Championship in the Ricardo Tormo Valencia Region Circuit, which has hosted the World MotoGP competition since 1999. If you are a motorcycle racing enthusiast, you’re probably more than familiar with this exciting competition and have attended MotoGP in Valencia, or at the very least, know about it. However, if you’re not, here you will find some helpful information you will need to know if you’re planning to attend a race at the Ricardo Tormo circuit in Valencia. Road Racing World Championship Grand Prix or, in short, MotoGP, is the premier motorcycling championship. Every season is comprised of 18 races spanning 14 countries and 4 continents. The world motorcycling championship is currently divided into three classes, MotoGP, Moto2 and Moto3. 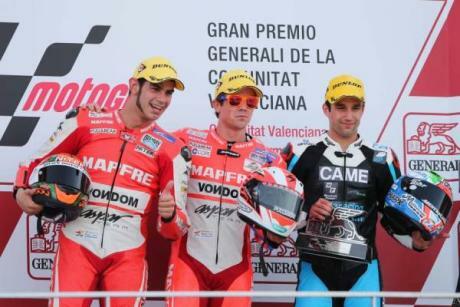 The Ricardo Tormo circuit usually holds the final race of the MotoGP season, namely Gran Premio de Valencia (Grand Prix of the Region of Valencia), as well as the awards ceremony and the final party. An event of such degree of importance makes this area an incredibly attractive destination for both national and international motorcycle racing fans alike during this time of the year. Spain is home to many successful riders, therefore the competition has a huge following all over the country. The Ricardo Tormo circuit opened its doors for the first time in 1999, and it’s named after a Spanish world champion in the 50 cc category, Ricardo Tormo, who won the world championship twice: in 1978 and 1981. He died of leukaemia in 1998. The circuit is located in the municipality of Cheste, Valencian Community, a 15-kilometre ride from the airport of Manises and 20-kilometre ride from the city of Valencia. It has a capacity of up to 120.000 people, making up a total area of 1.5 million square metres. The Ricardo Tormo circuit has held many races of MotoGP in Valencia since its inauguration, as well as other motor competitions over the years. It has received numerous awards over the years, positioning the circuit amongst the best race tracks in Europe in the present day. In addition to MotoGP and other car competitions, this circuit is in continuous use throughout the year, serving as a test track for GT’s, Formula 3 and Formula 1; a school for young racers, and other events. We invite you to come to enjoy MotoGP in Valencia. Make the most of your visit by spending a few more days exploring this beautiful region and the wonderful city of Valencia.